Did you know that your shower curtain and shower floor have 60 times more germs than your toilet seat! Grossed out? Me too. Women clean their showers on an average of 4 times a month, compared to 2.8 times for men, and I’m sorry to say this isn’t enough. Keeping on top of cleaning your bathroom is extremely important and we understand many of you lead busy lives with very little spare time. We decided to scour the internet and compile the best ways for you to clean your bathroom and have the best results possible. We also took time into consideration so don’t worry if you’re in a rush. With the understanding that these germs can’t be avoided but can be reduced. 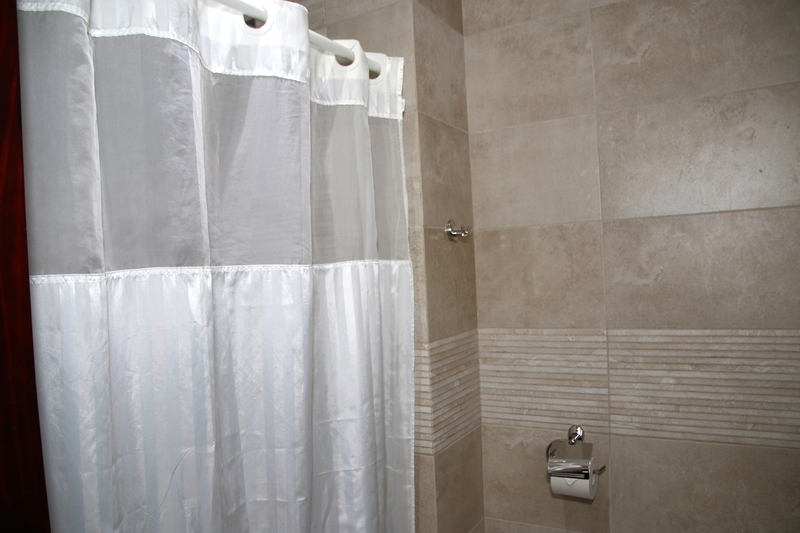 Shower curtains collect a whopping average of 16,240,000 CFU (colony-forming units)! Making sure your shower curtain is clean is very important, if you have a washable shower curtain, we recommend it is washed 1-2 times a week. This will kill any bacteria and reduce the average amount dramatically. If your shower curtain isn’t washable then we believe it is time to throw it out and purchase a washable one. This will save you having to spend your money on new shower curtains every week. 93% of the bacteria found on shower curtains are harmful to humans and can be resistant to antibiotics, so it’s in your own interests to wash the shower curtain weekly. Flashy floor cleaning gadgets and expensive products are too good to be true, the classic mop and bucket will do the same job at a much smaller price. Getting the right products to clean your floor with, knowing what type of floor you have and what chemicals can be used on it is extremely important. Don’t always just go to the high-end, well know, expensive brands. Do your research as I’m sure you’ll find most own brand companies sell the same item in different packaging at a very reasonable price. When you have selected your choice of cleaning chemical follow the instructions on the back of the bottle for best results. Door handles are often forgotten in the cleaning process even though they are known for how much bacteria lives on them. On average around 13,835 CFU live on your bathroom door handle! So, make sure you don’t miss them, a simple anti-bacterial wipe will reduce the numbers. There are also hundreds of home remedies which claim to do the job online, a very popular mixture is lemon juice and salt or bicarbonate of soda. These aren’t proven to work but are used by millions. The dreaded toilet seat, cleaning it is seen as a germ-infested chore. Did you know that your toothbrush has 192% more bacteria on it compared to your toilet seat? I’ll just leave that there. Toilet Bleach is a great way to quickly eliminate bacteria and takes no time at all, purchasing the right bleach can be overwhelming when in supermarkets. There are hundreds of brands and types, do your research, researching beforehand can save you a lot of time. Anti-bacterial wipes are a very efficient way to clean the outside of the toilet and very easy to dispose of.